It’s the second leg of the Liga MX clausura final. 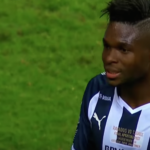 Monterrey scored in the first half to pull even with Pachuca 1–1 on aggregate. In the 74th minute, Pachuca defender Aquivaldo Mosquera’s attempt at a clearance failed, giving Dorlan Pabon a clear chance on goal to take the lead. So desperation instantly takes over and Mosquera decides to take Pabon down by any means necessary. Which translates to pulling him down by his shorts. Aquivaldo is shown a red card for the blatant offense, but it proves to be a blessing for Pachuca, as they go on to score a winner in the third minute of injury time to claim the title. Pachuca’s only other booking in the match came in the fourth minute, when Rodolfo Pizarro kicked an opponent in the face, causing the ball to hit him in the face, as a result. These have been the Dirty Tackles of the Day: a chronicling of unfortunate events.